When the kids ask me what my favorite color is, I usually answer, “All of them,” and I’m not kidding. Case in point – my coffee mugs. Long ago there used to be a Corelle outlet in Omaha and that’s where I got these beauties. I love their shape and also the fact that I can choose whatever color I’m in the mood for in the morning. Who am I kidding? There’s no choosing. I grab the one in the front of the cupboard. 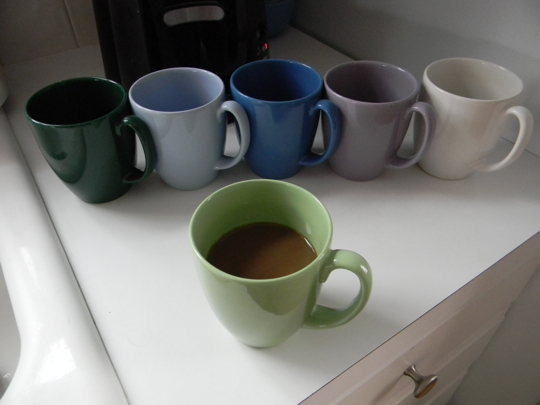 I like that all your mugs are “cool” colors. I like warm colors and all, but cools are my favorite. I love your response to the color question! If you don’t mind, I think I’m going to borrow it from now on. Do your school kids (I really mean their parents) give you mugs for Christmas? Where is THAT collection? If I could go back in time, the only thing I would change is collecting all of the mugs and building a garden wall with them.